W arewashers — they're the workhorses of the back of the house. They clean. They sanitize. And now they can even help lower energy consumption. Sure, you can specify a qualifed energy-effcient model and call it a day, but more often than not, user error and maintenance neglects will cut into your energy- and water-saving potential over the long haul. So we asked Amin Delagah, project engineer and resident water guru for the Food Service Technology Center in San Ramon, Calif., to review some of the best practices for optimal performance and maintenance to maximize both energy and water for four main dishwasher types. Type: Undercounter and Door-Type Description: Undercounter units, which wash one rack of dishes in about two minutes, fall into two main groups: low- temp models that use chemicals for the fnal sanitizing rinse and high-temp models that use hot water for this stage. And these units now have their own Energy Star ratings. 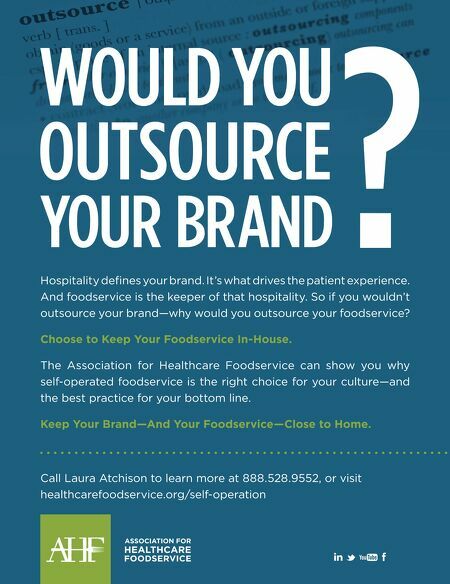 Foodservice operators that typically use undercounter and door-type units include cafés, small restaurants, bars and some quick-serve operations, where staff use them to wash glassware and other smaller wares. Door-type units are easy to load and unload because of their countertop position. These units can handle a variety of wares, from regular dish and silverware to pots and pans, using a single rack measur- ing about 20 inches by 20 inches. Optimal Operation • Make sure to use the correct type of rack for the unit, otherwise wares or the rack itself could get stuck and cause the machine to work harder. • Fully load the dishwasher before running it to save energy and water. • For low-temp models that don't have their own hot water boosters, make sure the main hot water system/ source is not located too far away from the unit, other- wise by the time the water reaches the washer it might not be hot enough to wash the rack properly, leading to poor performance and extra energy usage. • For both low-temp and high-temp models, if space is available, collect wares and wash them in batches — one rack after another in a fxed period of time — to maximize the hot water available at that time, rather than forcing the unit to have to rev back up after every 20 minutes (or however long the delay between washes might be). • Monitor and regularly calibrate the pressure gauge — most dishwashers operate at 20 PSI for optimal pressure (plus or minus 5 PSI). Pressure at 15 PSI could lead to poor performance and cause the machine to work harder. Pressure at 25 or more PSI could use extra en- ergy and water combined. Maintenance Monitoring • Regularly descale the machine to prevent it from break- ing down. Depending on use and the hardness of the water, some undercounter washers might need more regular maintenance than others. While a technician must perform some descaling, chemicals are available for periodic manual maintenance by the operator. • For hard water regions, consider a water softener or other form of fltration to lengthen the time between descaling and keep the unit operating at maximum effciency. • Monitor the rinse and wash arms for plugged-up food or debris. • Monitor the pressure gauge and routinely inspect for potential breakage. Type: Conveyor Description: These machines pull multiple racks through the wash and rinse cycles. Staff can load the racks from left to right or right to left. Highly customizable, foodservice opera- tors can opt to include a prewash section, which might feature a scrapper and/or spray valve, and they can have an additional power rinse prior to the fnal sanitizing stage. High-volume, high-throughput operations rely on these workhorses. Optimal Operation • Similar to undercounter and door-type washers, fully load these units to maximize energy and water use per wash. • Monitor both the pressure and the temperature gauges to maximize performance. 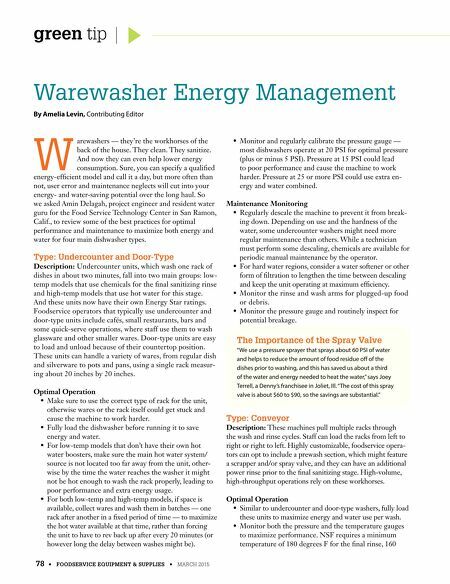 NSF requires a minimum temperature of 180 degrees F for the fnal rinse, 160 78 • FOODSERVICE EQUIPMENT & SUPPLIES • MARCH 2015 green tip Warewasher Energy Management By Amelia Levin, Contributing Editor The Importance of the Spray Valve "We use a pressure sprayer that sprays about 60 PSI of water and helps to reduce the amount of food residue of of the dishes prior to washing, and this has saved us about a third of the water and energy needed to heat the water," says Joey Terrell, a Denny's franchisee in Joliet, Ill. "The cost of this spray valve is about $60 to $90, so the savings are substantial."